View of the Oil mill on Twickenham Common. Oil mills were generals located in the west of England but there were small number in the south east, usually located near rivers or ports. Rapeseed or linseed was the raw material worked in these mills and large quantities of oil for use in lamps, soaps paints and the manufacturer of linoleum was produced. The oily by-product of the process was used to make cattle feed and was very valuable for the local economy. 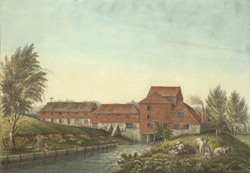 In the 16th century two mills were built on the river Crane in Twickennham – the one which is depicted in this picture was situated at the point where Mill Road crosses the southern stream of the Crane by the former Fulwell Park. For a short time it was a copper mill but by 1767 it had become an oil mill. By 1865 the mill was converted to papermaking and it is thought that it went out of use around the year 1880.